Every travel blog needs a page dedicated to their wheels, no? We refer to our wheels as a truck even though it’s an SUV. Changed: transmission, radiator, power steering fluids, differentials, and coolant. Now for the fun stuff, the mods! Not only did we need to fit everything in the truck, but it was imperative (to me) that it be organized and easily accessible. If anyone is wondering, we are not keeping storage anywhere. We assume that anything we may want in the future will not be worth carrying around until we’re ready to settle (and certainly not worth paying to store!). It amazes me how hard this is for others, I am constantly hearing, “You’re getting rid of that? ?”, “You’re giving up all of this? ?” – It’s not even their stuff and they can’t let go of it! With that being said, we do still have a fair amount of stuff! When we first planned this we were going to take Tom’s Jeep Liberty and we had pretty much finished outfitting it for the trip. When we bought Gwen, we had a fresh slate and what worked in the Jeep was never considered for the Pathfinder. In the Jeep we had built a platform to cover the storage below; it was no more than plywood with 2×4 legs covered with gym flooring. It fit the Jeep and provided a place to put things whilst rifling through the contents of the storage below. Tom had also figured out that we could prop a piece of plywood under the lip of the life gate to create a table. Where the back seats were he made a platform for the fridge to sit on and constructed a lock box for the floor. What we’ve done in the Pathfinder blows away any plans we had for the Jeep! 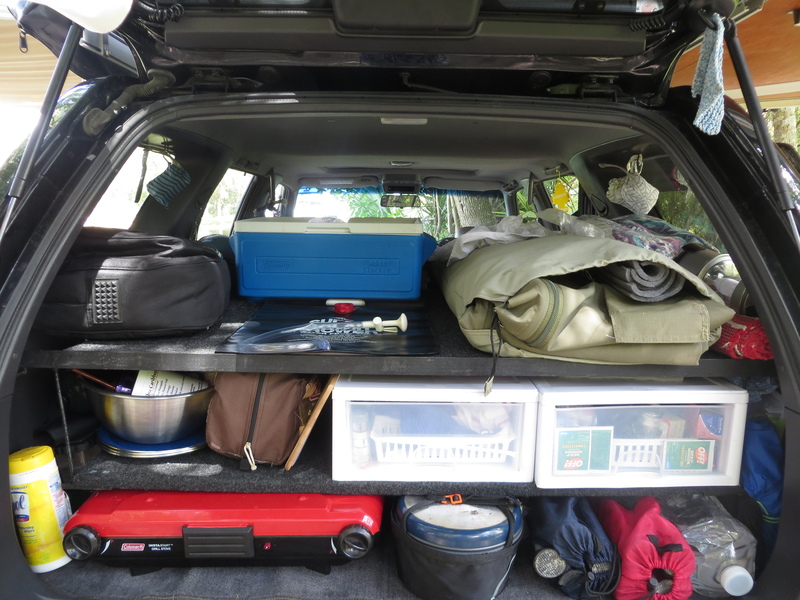 After loading the Pathfinder up with all our gear we started to think more about convenience. Although it makes sense to keep everything together (camp stuff, kitchen stuff, clothing, etc. ), it’s not always feasible. After a few camping trips with the Jeep we realized sometimes you just want your fork without going through an entire bin of utensils or the lantern without pulling out all the camping gear. So staring into the fully packed Pathfinder it started to click that bins were not the best use of space, nor would they be the most convenient when actually living out of the truck. Mostly everyone agrees a 2 tiered system is the way to go, but I had seen a few set-ups utilizing a draw system in the cargo area and I felt that a hybrid of the two would be best. With all of our gear in the garage I started putting the puzzle together. Once we had an idea of the gear lay-out we were able to measure key pieces and designed the shelving around that. We went with a two tiered shelf covered with a removable board that will double as a table. We have a 16 cu. ft. Thule for the roof for all the “attic stuff”. Cutting the support rails for the top shelf. Admittedly, I couldn’t quite grasp his vision at this point! Using the brackets that held the cargo cover, clever Tom secured the support bar. It’s amazing how much a plan can change while in the middle of executing it! Here is the backseat platform with the fridge. The shelf has a bracket to suspend it from the support beam. All that woodworking took the entire weekend but luckily Hurricane Sandy came for a visit and we got a bonus day off! I took advantage of the time and carpeted every piece; it looks great but it took about 8 hours! and he wanted me to put the shiny new macbook in there to be bumped all around!? It wasn’t easy to figure out how to pad it (using what we had) without taking much away from the total available space. But after much debate, I decided to use bubble wrap and the padding from the mac’s original box. then laid the carpet over that and adhered it to the sides, framing the layers of bubble wrap. I cut the foam from the mac box and adhered it to the sides of the box. So after days of work, we finally have a finished product! We also changed out the radio to one with Bluetooth so we can listen to Pandora or our iPod and the GPS through the radio. While we were there we decided to get the inverter and auxiliary battery installed. The only inverter he had was 2000 watts and we figured, “why not?”. We also didn’t know much about battery systems so we went off his recommendation to get a 20 amp/hour battery. The small battery was installed under the roof with the Optima Blue Top (which we were originally going to use). The inverter was installed on the center bump behind the front seats. We have installed new heavy-duty shocks, and most importantly, airbags. When we left we were right about at max weight and we were only slightly low in the rear. Over a few thousand miles however, the rear sagged more and more. When we got the RTT we were 50lbs under max weight but bottoming out on almost every bump in the road. The airbags made a world of difference and are recommended to anyone with any sag! We also have had an alignment done; we had one when we bought the tires before leaving but the car was empty, not even back seats! It didn’t occur to us until later that we should have it done while loaded up. We also had the tires rotated at this time. Amazing how fast the miles add up! After countless morning hours without power, we switched to a smaller 400 watt inverter, thinking the 2000 watt was a power hog. We also decided to scrap the 20 amp/hour battery (something we knew almost instantly after installation that we were going to do eventually) for a regular, starter battery. Tom switched up the inverters and hooked it to the Blue Top, and the car to the starter battery. We can run our fridge for about 13 hours while charging a laptop or the phone. Storage is great, everything has a place and always fits, with room for more. I am so happy with our set-up, it couldn’t be more perfect if we lived in a house! wow! it looks like so easy/fun! and, actually – it was! Love the journey and love the love into it. PS, welcome to the open road! You guys really write a great blog, def a big help with a lot of stuff, thanks so much for sharing all your info.